The Monster Study was a stuttering experiment on 22 orphan children in Davenport, Iowa, in 1939 conducted by Wendell Johnson at the University of Iowa. Johnson chose one of his graduate students, Mary Tudor, to conduct the experiment and he supervised her research. After placing the children in control and experimental groups, Tudor gave positive speech therapy to half of the children, praising the fluency of their speech, and negative speech therapy to the other half, belittling the children for every speech imperfection and telling them they were stutterers. Many of the normal speaking orphan children who received negative therapy in the experiment suffered negative psychological effects and some retained speech problems during the course of their life. Dubbed “The Monster Study” by some of Johnson’s peers who were horrified that he would experiment on orphan children to prove a theory, the experiment was kept hidden for fear Johnson’s reputation would be tarnished in the wake of human experiments conducted by the Nazis during World War II. The University of Iowa publicly apologized for the Monster Study in 2001. Wendell Johnson was a tall, knobby 20-year-old farm boy when he arrived at the University of Iowa in Iowa City to study English in 1926. The class president and valedictorian of his tiny high school in Roxbury, Kan., Johnson was engaging, ”quite a clown” in the estimation of the folks back home. He also stuttered grotesquely, often rendered speechless by the impediment. His inability to express himself nudged him toward writing and literature, and he developed a penchant for antic humor, which kept him popular despite his silence. It also propelled him to U. Iowa, the most famous center for stuttering research in the world. Around the country, speech pathology was fighting to be recognized as a science, and Iowa was the new discipline’s polestar. Dozens of experiments were under way when Johnson arrived, and he enthusiastically threw himself into the invigorating work, switching to psychology for his master’s study. ”I became a speech pathologist because I needed one,” he’d later say. At the time, physiology had become the favored explanation at Iowa for stuttering. The department’s lead professors were certain that the disorder originated in misdirected brain signals. They had used a new device called an electromyograph to study neuromus-cular activity in stutterers, nonstutterers and, in one experiment, people who were drunk (students who, solely in the interests of science, had become soused; the researchers skirted Prohibition by requisitioning alcohol from the university hospital.) The readouts from the booze-tinged subjects showed, to no one’s surprise, impair-ment. Intriguingly, more comprehensive experiments showed that stutterers had subtle neuromuscular responses different from those of their nonstuttering peers. This idea was provocative and powerful, with enormous implications for speech therapy. If stuttering is learned behavior, it can be unlearned. Biography, however, isn’t proof. Johnson, to validate his thesis, needed to design an experiment that induced stuttering. If, he reasoned, any and every child could be made to stutter, then obviously no underlying physiological defect was required. If stuttering could be called forth in normal youngsters, it would be proved as a learned, conditioned response. In the fall of 1938, Wendell Johnson recruited one of his clinical psychology graduate students, 22-year-old Mary Tudor, who was avid but timorous, to undertake exactly that experiment. She was to study whether telling nonstuttering children that they stuttered would make it so. Could she talk children into a speech defect? The university had an ongoing research relationship with an orphanage in Davenport, Iowa, so Johnson suggested she base her study there. And thus, on Jan. 17, 1939, Mary Tudor drove along the high, swooping bluffs overlooking the Mississippi River to the Soldiers and Sailors Orphans’ Home. She toted notepads, chalkboards, a Smedley dynamometer (to measure hand strength) and a cumbersome Dictaphone. The Iowa soldiers and Sailors Orphans’ Home was founded as a refuge for the offspring of men killed in the Civil War. By 1939, at the height of the Great Depression, it housed more than 600 orphans and demi-orphans (those whose destitute parents, although alive, couldn’t care for them) in clusters of small cottages. Not as harsh as the nearby Industrial School for Boys in Eldora, Iowa, or as forlorn as the Institute for Feeble-Minded Children at Glenwood, it was nevertheless spare, joyless and regimented. Children rose at 5:30 a.m., had breakfast and cleaned until school began. They marched in long, careful lines, to facilitate order. On that first January visit, Tudor tested each child’s I.Q. and handedness. A voguish theory then held that stuttering was caused by a cerebral imbalance. If, for example, you were born left-handed but were using your right hand, your nerve impulses would misfire, affecting your speech. Johnson felt the notion was nonsense, but he was thorough and suggested Tudor discern each child’s handedness. She had them draw on chalkboards and squeeze the bulb of the dynamometer. Most were right-handed, but a sprinkling of lefties ran through all the groups. There was no correlation between handedness and speech in this subject crop. That was an auspicious start. The sixth orphan, Mary Korlaske, a 12-year-old, grew withdrawn and fractious. During their sessions, Tudor asked whether her best friend knew about her ”stuttering,” Korlaske muttered, ”No.” ”Why not?” Korlaske shuffled her feet. ”I hardly ever talk to her.” Two years later, she ran away from the orphanage and eventually ended up at the rougher Industrial School for Girls. ”I couldn’t never tell my husband about it,” Korlaske, now Mary Nixon, said in a brief telephone conversation in January. ”It just ruined my life.” Her voice broke. ”I can’t talk no more,” she said, and with an audible oath, she hung up. Mary Tudor herself wasn’t untouched. Three times after her experiment had officially ended she returned to the orphanage to voluntarily provide follow-up care. She told the IIA children that they didn’t stutter after all. The impact, however well meaning, was questionable. she wrote to Johnson about the orphans in a slightly defensive letter dated April 22, 1940, ”I believe that in time they . . . will recover, but we certainly made a definite impression on them.” The emphasis is hers. This lacerating curiosity drove him to undertake a series of ingenious experiments, before and after the Tudor study, into the essential nature of stammering itself. What is it? How does it work? To answer these questions, he began by giving stutterers a page bordered in red and having them read aloud in front of an audience, where their stuttering would become worse. Afterward, the subjects tended to stutter painfully anytime they read a page marked with red, even when reading to a single person. Next, he blacked out words over which a particular stuttering reader had stumbled. When the person reached the word next to the one crossed out, he’d stutter. He’d become accustomed to stumbling there and, even without the troublesome word, he still did. These results said to Johnson that stuttering was indisputably a conditioned, learned response. He also proved that individual stutterers were consistent. They tended to stumble over the same sounds (although the sounds themselves varied from person to person) and grew to dread them, often substituting entire words. (”My f-f-fa . . . dad.”) They’d also whisper. When they were about to reach troublesome fricatives, their eyes would bulge. They’d thump their knees, click their fingers, rasp desperately or shake their heads in a spasmodic attempt to force out the sound. Johnson defined those actions as the associated behaviors of stuttering and claimed that in adults they would diminish if the stutterer relaxed and didn’t anticipate a speech block. He liked to point out that in certain situations even the most afflicted don’t stutter, during, for instance, singing or in unpressured speech with infants or dogs. ”One severe stutterer virtually lived the life of a nomad because he was able to communicate vocally only whenever he established himself in a new town,” wrote Oliver Bloodstein, who did Johnson’s fieldwork. Johnson’s findings about the nature of stuttering, once it has begun, remains the accepted wisdom to this day. The disorder does respond to conditioning, and once established, stuttering can have a ruinous momentum. Often, the worse someone stutters, the more he fears speaking, and the worse his speech becomes. What Johnson’s thinking did not explain is why severe stuttering starts. Episodes of speech disfluency are common among adults and children, especially the very young. But about 5 percent of all youngsters exhibit clinical stammering, according to Ehud Yairi, a professor of speech and hearing science at the University of Illinois. Of these, about 75 percent recover without treatment, but about 1 percent of all people (about three million Americans) continue to stutter noticeably into adulthood. It is those whom Johnson studied in his work on the progression of the disorder. Why, though, were those few stricken in the first place? Johnson had no family history of stuttering and dismissed the possibility that the condition could be heritable. ”Stuttering is learned behavior, Johnson said, and he repeated it again and again,” Bloodstein wrote in an e-mail message. ”It virtually became his mantra.” He had indirect, anecdotal data, too, that backed his contention. Beginning in 1934, he and his assistants questioned the mothers of dozens of young stutterers, asking when the disorder had begun and how the family had responded. He also tested age-matched ”normal” speakers and found that they had many speech defects as well. Unfortunately for the ”stutterers,” Johnson said, their parents overreacted, made the children panic and produced full-blown stuttering. The diagnosis caused the condition. 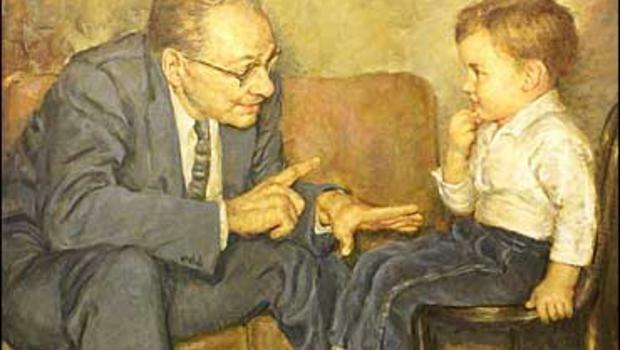 Johnson termed this the diagnosogenic theory, and it became the cornerstone for his writing and teaching, his growing fame and eventually the basis for his ideas about the treatment of stuttering children. It also, by its dictates, should have ensured that all the orphans in Mary Tudor’s Group IIA would stutter soon after Tudor began telling them that they did. But they did not. In fact, the most telling aspect of Mary Tudor’s experiment is that it failed completely. Of the six normal children who were falsely labeled stutterers, two actually improved their speech fluency, according to the researchers’ ratings, over the course of the five-month study — one by almost a full point, from 3 to 3.8. Another’s fluency rose from 3 to 3.6. For two others, their fluency ratings didn’t budge. Of the two children whose fluency fell, one, Clarence Fifer, dropped from 2.6 to 2, the second, Hazel Potter, from 3.1 to 2.8. The other primary study group fared little better. Of the actual stutterers who were told they now spoke fine, two showed slight improvements in fluency, two decreased in fluency and one was unchanged. The results for each of the groups were ”not only insignificant, but also in the wrong (unexpected) direction,” concluded Yairi and a colleague in an article in the May 2002 issue of The American Journal of Speech-Language Pathology. The experiment did, however, have an impact. In each case, the nonstuttering children of Group IIA began to act like stutterers. ”All of the children in this group showed overt behavioral changes,” Mary Tudor wrote in her thesis, ”that were in the direction of the types of inhibitive, sensitive, embarrassed reactions shown by many adult stutterers in reaction to their speech. There was a tendency for them to become less talkative.” They also, during their sessions with her and in front of the researchers, shuffled their feet, whispered, snapped their fingers, gulped, gasped and clamped their mouths shut. They looked like stutterers. They spoke fine. It seems highly unlikely that you can make a stutterer. You can induce the accompanying tics — the shuffling and the self-consciousness. Those can be taught and reinforced. But clinical stuttering cannot. It exists or it doesn’t. Johnson’s theory was not upheld. From the 1950’s until the early 1980’s, Johnson’s theory, unsullied by doubts, was the underpinning of most childhood speech intervention in America. Therapists, swayed by diagnosogenic theory, declined to work directly with young stutterers, fearing that the therapy could worsen the affliction. They’d instead counsel a child’s parents, telling them to stop worrying so much. Sometimes this helped the child. Other times it didn’t. Nowadays, researchers think that the most helpful form of speech therapy is working directly with children. In face-to-face sessions with their therapists, children are encouraged to practice breath control, easing words out instead of forcing them and stretch out sounds to make them longer. One can’t help wondering what would have happened had Johnson published the Tudor findings. Would the results have raised issues that might have led to an earlier shift in treatment for stuttering children? And would those young stutterers have been better served by this more direct intervention? We can’t know. Though researchers now have more success reducing disfluency in children, the discipline of speech therapy remains inexact and, for some stutterers, eternally ineffective. ”We don’t have any way of measuring the impact of having lost the Tudor study for all those years,” Zimmermann says. In 1965, at 59, Wendell Johnson sat at his desk still defending diagnosogenic theory. He was preparing an entry for the Encyclopaedia Britannica on ”Speech Disorders” when he suffered a massive heart attack. The 4,000-word essay, completed and published posthumously, brooks no dissent. ”The child learns speech-disruptive behavior as he tries to keep from stuttering and so to gain approval,” he writes. Johnson’s didacticism lessens near the end, however, and he grows almost gentle. ”Persons with speech disorders . . . have traditionally known the scorn, ridicule and even revulsion of their society,” he writes in the voice of a man driven all his life to make sense of the ability to speak. Photos: (Dan Forbes, original painting of Wendell Johnson by Cloy Kent, 1978; Hazel Potter Dornbush today. as an orphan in 1939, researchers tried to turn her into a stutterer. ”imagine,” she says, ”trying to wreck a little child’s voice.” (Larry Fink for The New York Times) Credits, Page 56: Stylist: Renata Lindlar. Location: The General Theological Seminary, New York. Models: Jason Marchant/Dietz Marchant Dance, Brittany Reese/Sarah Skaggs Dance. Hat: Patricia Underwood. Gretchen Reynolds is a writer who lives in Santa Fe.